My Peregrination around The Isle of Sheppey,* Island No. 2 of my UK Islands Project, began with a visit to Tate Britain. After discovering that the famous British artist J W M Turner (1775 - 1851), visited and painted on the Isle of Sheppey, I wanted to try to ‘see what he saw’ and went in search of any paintings he had created whilst he'd been there. 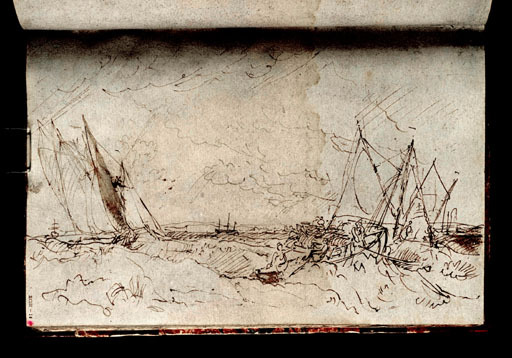 This led me to discover that Tate Britain, who holds the World's largest collection of Turner’s work, had some 300 of his sketchbooks – some of which (well, three) contained sketches of Sheerness and views from The Isle of Sheppey. Much excitement followed as I found that I could make an appointment (free) with the Prints and Drawing room at the gallery to view these sketchbooks. The viewing of any artworks not currently on display is open to anyone. All you need to do is request an appointment detailing what works you want to see, and when you arrive (it’s in a secure, temperature controlled room near the Clore Gallery) show some photo ID and a very helpful member of the team there will show you to a viewing desk and depending on the artworks, show them to you. Alice was the member of staff who helped me and who unwrapped the sketchbooks I’d come to view. Even though I wasn’t permitted to handle or photograph them (they are actually available to view online) it was exciting to see the actual books that Turner had used, to see his lines and tone and to get a feel of the paper and kinds of books he'd taken on his many travels (Turner loved to travel). Turner’s sketches were very light, fluid and quick. He was able to express what he saw in just a few lines. Inspiring. Some sketches were nothing more than a single line, others contained so much movement and drama that they seemed to leap out of the page. I felt very lucky to be sitting there looking at these ‘behind the scenes’ works that were the starting points for Tuner's exquisite large scale paintings. (I really liked Turner's sepia sketches and as a result have ordered some sepia ink for my own drawing pen). I had hoped to be able to get an idea of where he’d been standing in Sheerness so that when I went I could stand ‘roughly’ in the same position. Unfortunately, Turner hadn’t included any GPS coordinates on any of his sketches so it was very difficult to tell exact spots as there were no real landmarks. They were all pretty much looking out to sea from Sheerness. 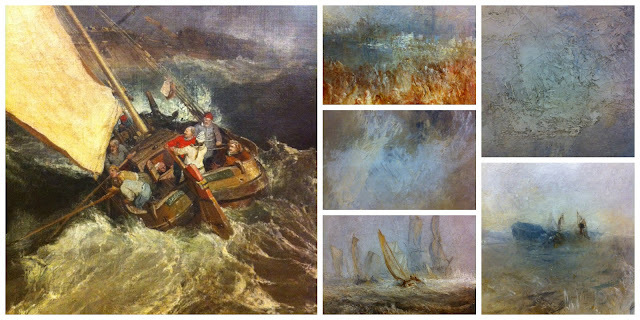 Once my allotted time in the Drawing and Prints room was up, I went for a wander around the Clore Gallery which has a permanent exhibition of Turner’s work and it struck me how I was drawn to certain parts of paintings. 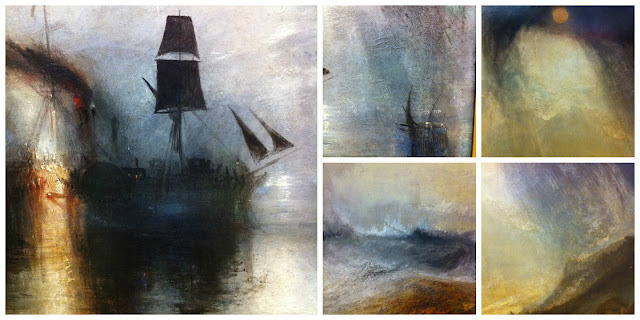 Prior to this research I can’t say I’d ever really been a big fan of Turner’s work – but looking at it now and seeing the light, colour and texture I developed a new sense of appreciation. One of Turner's most famous paintings - The Fighting Temeraire, has a clear link to Sheerness and The Isle of Sheppey. This painting is actually held at The National Gallery, so wasn't one I saw on this trip. What do you think of Turner's work? Next stop….The Isle of Sheppey! *The artist William Hogarth wrote about his 'Five day Peregrination Around The Isle of Sheppey', basically a 'lads night out' in 1732. It makes for fun reading! All other images are authors own.